Lt. 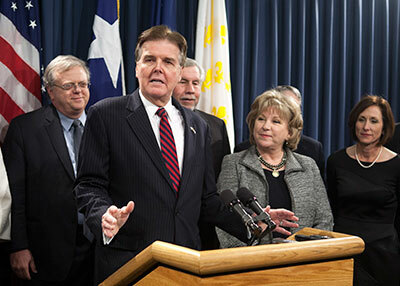 Governor Dan Patrick promoted a three-bill package aimed at property and franchise tax reduction at a Tuesday press conference. He was joined at the podium by Senate Finance Committee Chair Jane Nelson, who authored two of the measures. (AUSTIN) — Lt. Governor Dan Patrick and Finance Committee Chair Senator Jane Nelson joined with other Senators to lay out a plan they say will give $4.6 billion in tax cuts to home and business owners in the state. State leadership has promised a budget that gives significant tax relief, with Governor Greg Abbott vowing to reject any budget that failed to do so. Patrick said that tax cuts are long overdue. "Texas' economy stays strong if people have more money in their pockets and if businesses have more money in their pocket to create jobs and grow their businesses," he said. The tax cut package is made up of three measures. The first is SB 1, by Nelson, which would raise the homestead exemption. Nelson said the last time the homestead exemption was raised was in 1997 and was a flat ten thousand dollar increase. "Home values, obviously, have risen over the years but the homestead exemption has remained flat," she said. Nelson's bill would set the homestead exemption for local property taxes at 25 percent of the median home price in Texas each year. For 2016, Nelson said that would mean an average homestead exemption of about $33,000, totaling about $2.5 billion in tax relief for the next biennial budget. That amount would go up or down each year depending on state property values. The next two bills are aimed at the state franchise tax. The first, SB 7, also by Nelson, is a permanent 15 percent reduction to the franchise tax rate. She said that would work out to about $1.5 billion in tax relief for business owners over the next two years. The second bill, SB 8 by Georgetown Senator Charles Schwertner, would raise the exemption from the current $1 million to $4 million. That means business with total revenue less than $4 million would not pay the franchise tax. Schwertner says this will exempt 61 thousand small businesses in the state, and would equal $380 million in tax cuts. At the same time, it would only mean about an 8 percent reduction in franchise tax revenue. "Senate Bill 8 provides meaningful tax relief to the small businesses who need it most while still maintaining a balanced budget," said Schwertner. Patrick told reporters that this is just another step toward his goals for tax relief in the future. The initial filed budget bill contained $4 billion as a placeholder amount, and the tax bills unveiled Tuesday move that amount up another $600 million. Patrick said that the Senate is still considering bills that would rein in appraisal growth and eventually, he would like to see the franchise tax eliminated altogether. "What better message to attract businesses to Texas than to say this is a state where we have light regulation, we have tort reform and one day, zero business taxes," said Patrick. The Senate Finance Committee will wrap up its initial round of hearings on the state budget this week. Nelson said her committee will spend next week looking at all filed tax relief bills, including the three bills announced Tuesday. 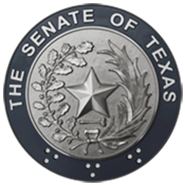 The Senate will reconvene Wednesday, February 25th at 11 a.m.